Jaws could have been averted entirely if the humans had just had an extra copy of "Back in Black." Great White Sharks have a special place in human consciousness - they're mysterious, enigmatic creatures that also scare the bejeezus out of us, what with being one of the most lethally-designed predators in all of history. They may not attack humans nearly as much as some people believe, but they're still potentially terrifying killing machines. Oh, and they really love Australian hard rock band AC/DC. 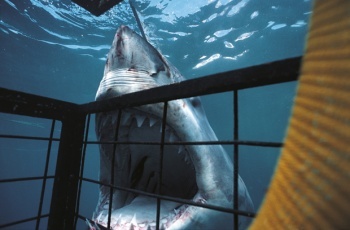 Matt Waller, a charter boat operator in South Australia's Neptune Bay, found that blasting AC/DC underwater made the area's Great Whites far less threatening than they normally were. When Waller played "You Shook Me All Night Long" and "Back in Black" over underwater speakers, the sharks became "more investigative, more inquisitive and a lot less aggressive," he told Aussie outlet ABC. "[They] actually came past in a couple of occasions when we had the speaker in the water and rubbed their face along the speaker which was really bizarre." Waller says he was inspired to try his heavy-metal solution after speaking with some divers who told him that they played music underwater to change the sharks' behavior in the hopes of not becoming a Great White's next meal. Waller experimented with his albums, and found that AC/DC was a hit with the apex predator. But why? As Waller told Australian Geographic, sharks "don't have ears, they don't have long hair, and they don't head bang past the cage doing the air guitar." Even if they can't hear the sounds, says Waller, they can feel the vibrations - and AC/DC's hard rock produces a lot of very low vibrations. He intends to play a variety of songs and albums in hoping to identify common characteristics that produce the same effect on sharks. Not only could this help us understand sharks better, says Waller, he also thinks it has a practical benefit: Cage-diving companies could use music to reduce danger instead of shark bait as a more economical and environmentally friendly alternative. Next, Waller plans on trying out some Zeppelin, but his kids think the sharks will like the White Stripes and Wolfmother more. I'm going to just throw my vote in for Judas Priest and see where it gets us.